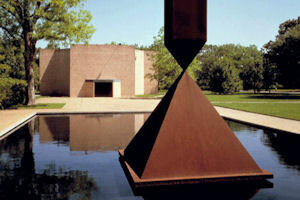 The Rothko Chapel, founded by Houston philanthropists John and Dominique de Menil, was dedicated in 1971 as an intimate sanctuary available to people of every belief. A tranquil meditative environment inspired by the mural canvases of Russian born American painter Mark Rothko (1903-1970), the Chapel welcomes over 80,000 visitors each year, people of every faith and from all parts of the world. On the plaza, Barnett Newman's majestic sculpture, Broken Obelisk, stands in memory of Dr. Martin Luther King, Jr. The Rothko Chapel and grounds will close to the public beginning Monday, March 4, 2019, after the 2019 spring symposium “Toward a Better Future: Transforming the Climate Crisis,” and will reopen in winter 2019. This temporary closure is the first part of the implementation of the Rothko Chapel Opening Spaces master plan, focused on preserving the Chapel as a unique public art site and spiritual space, serving the growing number of visitors and program participants, and setting the stage for programmatic expansion. 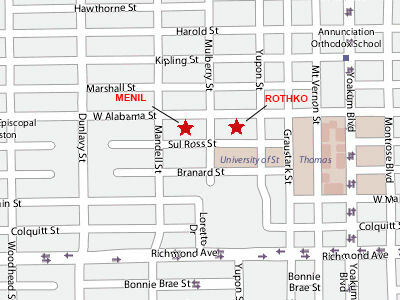 The Rothko Chapel is an independent institution, a sacred place open to all people, every day. In 2014 the Chapel celebrated its forty-third anniversary, having achieved, in those years, recognition as one of the greatest artistic achievements of the second half of the twentieth century. In 2001 the Chapel was listed in the National Register of Historic Places, an honor awarded before the institution was fifty years old. The Chapel regularly makes top ten lists of places to visit, and is a featured entry in National Geographic's book Sacred Places of a Lifetime: 500 of the World's Most Peaceful and Powerful Destinations, published in 2009. The Chapel has two vocations: contemplation and action. It is a place alive with religious ceremonies of all faiths, and where the experience and understanding of all traditions are encouraged and made available. Action takes the form of supporting human rights, and thus the Chapel has become a rallying place for all people concerned with peace, freedom, and social justice throughout the world.